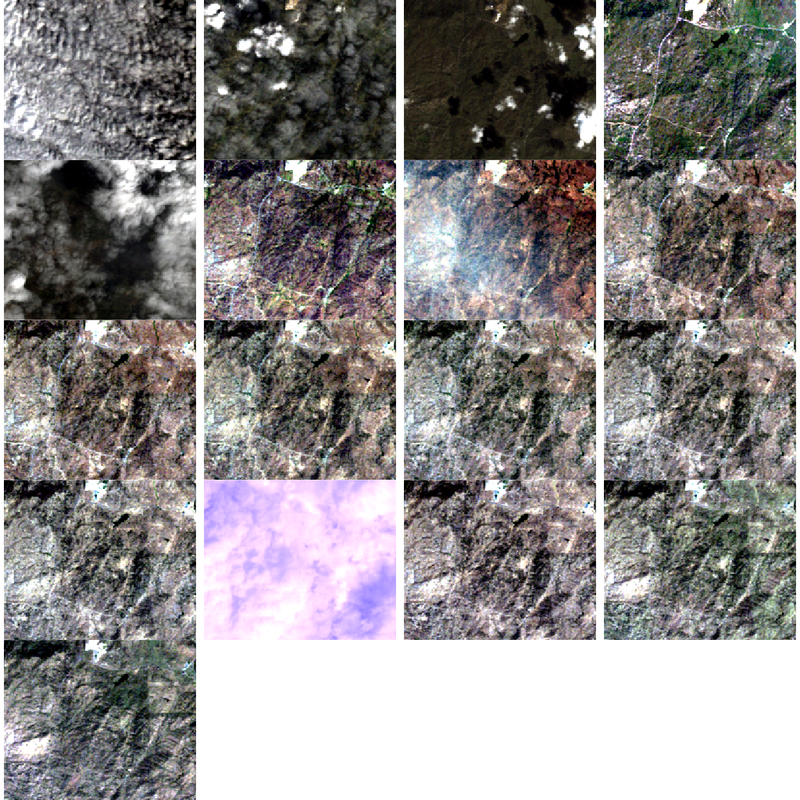 How can I calculate, extract, and export summarized raster pixel data? Extract summary pixel values from a raster. Save summary values to a .csv file. Plot summary pixel values using ggplot(). Compare NDVI values between two different sites. See the lesson homepage for detailed information about the software, data, and other prerequisites you will need to work through the examples in this episode. In this episode, we will extract NDVI values from a raster time series dataset and plot them using the ggplot2 package. We often want to extract summary values from raster data. For example, we might want to understand overall greeness across a field site or at each plot within a field site. These values can then be compared between different field sites and combined with other related metrics to support modeling and further analysis. Our goal in this episode is to create a dataframe that contains a single, mean NDVI value for each raster in our time series. 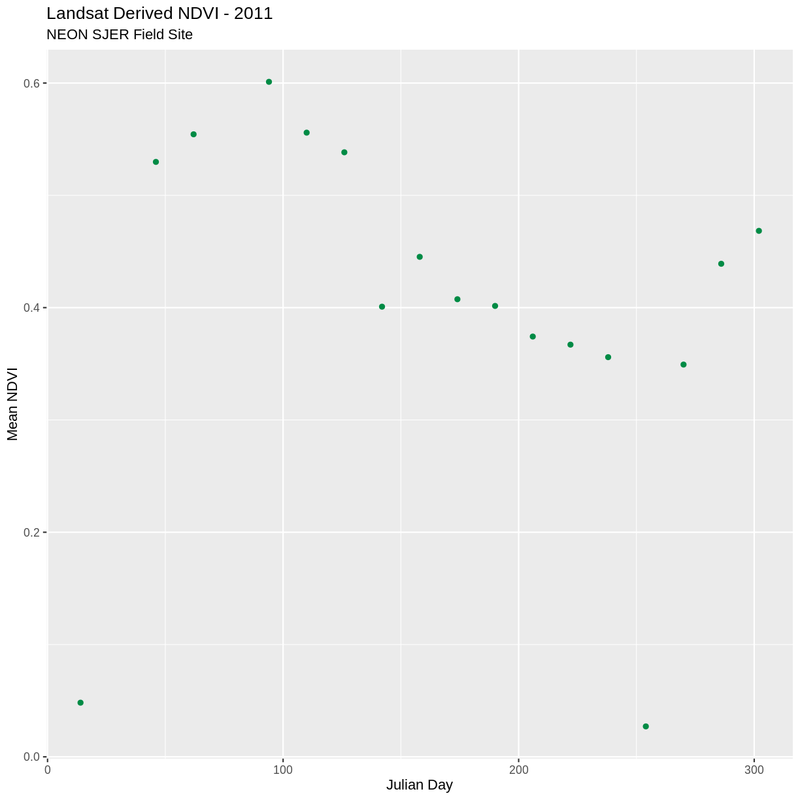 This value represents the mean NDVI value for this area on a given day. We can calculate the mean for each raster using the cellStats() function. The cellStats() function produces a named numeric vector, where each value is associated with the name of raster stack it was derived from. We can then convert our output to a data frame using as.data.frame(). It’s a good idea to view the first few rows of our data frame with head() to make sure the structure is what we expect. We now have a data frame with row names that are based on the original file name and a mean NDVI value for each file. Next, let’s clean up the column names in our data frame to make it easier for colleagues to work with our code. It is a bit confusing to have duplicate object & column names (avg_NDVI_HARV). Additionally the “avg” does not clearly indicate what the value in that particular column is. Let’s change the NDVI column name to MeanNDVI. By renaming the column, we lose the “HARV” in the header that reminds us what site our data are from. While we are only working with one site now, we might want to compare several sites worth of data in the future. Let’s add a column to our dataframe called “site”. We can populate this column with the site name - HARV. Let’s also create a year column and populate it with 2011 - the year our data were collected. We now have a dataframe that contains a row for each raster file processed, and columns for meanNDVI, site, and year. We’d like to produce a plot where Julian days (the numeric day of the year, 0 - 365/366) are on the x-axis and NDVI is on the y-axis. 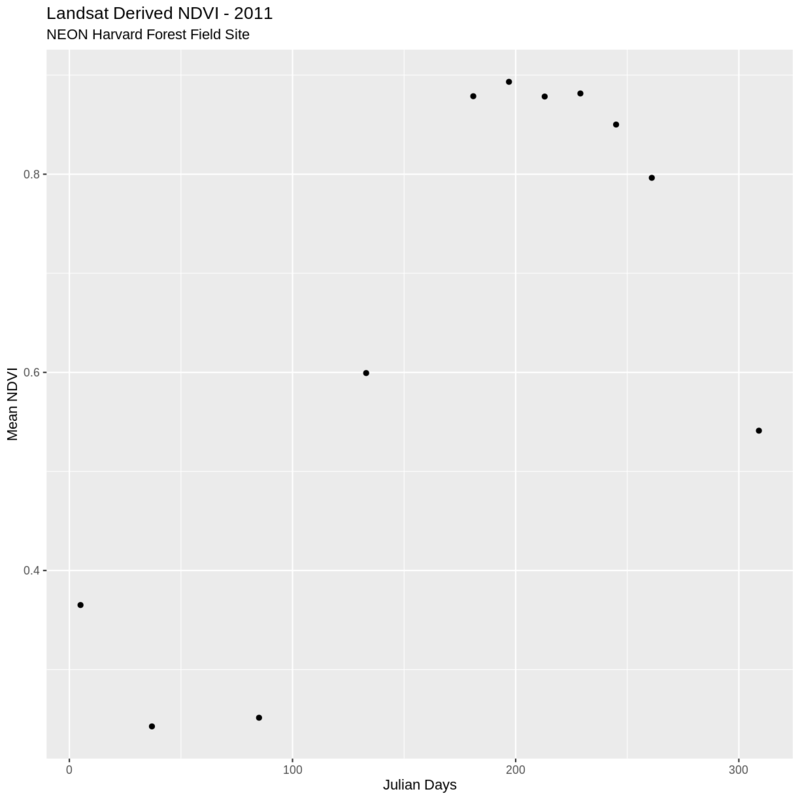 To create this plot, we’ll need a column that contains the Julian day value. One way to create a Julian day column is to use gsub() on the file name in each row. We can replace both the X and the _HARV_NDVI_crop to extract the Julian Day value, just like we did in the previous episode. This time we will use one additional trick to do both of these steps at the same time. The vertical bar character ( | ) is equivalent to the word “or”. Using this character in our search pattern allows us to search for more than one pattern in our text strings. "005" "037" "085" "133" "181" "197" "213" "229" "245" "261" "277"
Now that we’ve extracted the Julian days from our row names, we can add that data to the data frame as a column called “julianDay”. Currently, the values in the Julian day column are stored as class character. Storing this data as a date object is better - for plotting, data subsetting and working with our data. Let’s convert. We worked with data conversions in an earlier episode. For a more introduction to date-time classes, see the NEON Data Skills tutorial Convert Date & Time Data from Character Class to Date-Time Class (POSIX) in R.
To convert a Julian day number to a date class, we need to set the origin, which is the day that our Julian days start counting from. 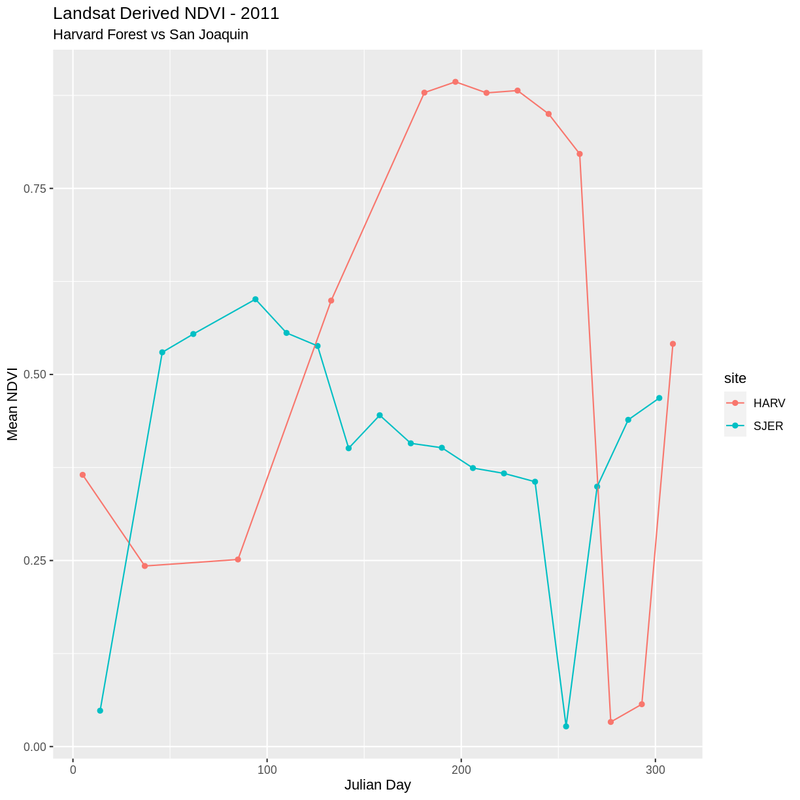 Our data is from 2011 and we know that the USGS Landsat Team created Julian day values for this year. Therefore, the first day or “origin” for our Julian day count is 01 January 2011. Next we convert the julianDay column from character to integer. Once we set the Julian day origin, we can add the Julian day value (as an integer) to the origin date. Note that when we convert our integer class julianDay values to dates, we subtracted 1. This is because the origin day is 01 January 2011, so the extracted day is 01. The Julian Day (or year day) for this is also 01. When we convert from the integer 05 julianDay value (indicating 5th of January), we cannot simply add origin + julianDay because 01 + 05 = 06 or 06 January 2011. To correct, this error we then subtract 1 to get the correct day, January 05 2011. "2011-01-05" "2011-02-06" "2011-03-26" "2011-05-13" "2011-06-30"
Since the origin date was originally set as a Date class object, the new Date column is also stored as class Date. We often want to compare two different sites. The National Ecological Observatory Network (NEON) also has a field site in Southern California at the San Joaquin Experimental Range (SJER). 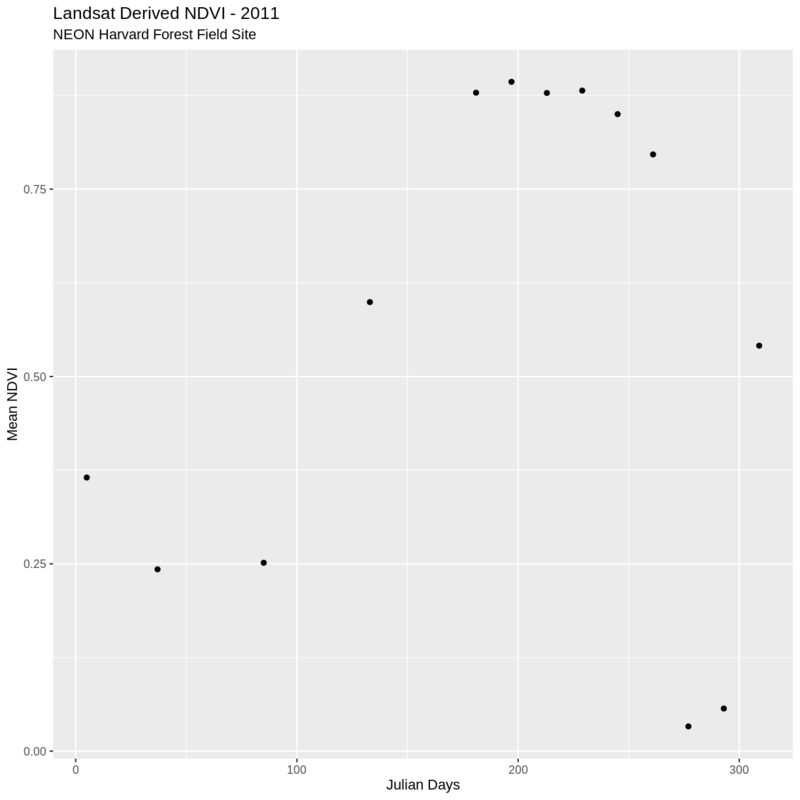 For this challenge, create a dataframe containing the mean NDVI values and the Julian days the data was collected (in date format) for the NEON San Joaquin Experimental Range field site. NDVI data for SJER are located in the NEON-DS-Landsat-NDVI/SJER/2011/NDVI directory. First we will read in the NDVI data for the SJER field site. Then we can calculate the mean values for each day and put that in a dataframe. Next we rename the NDVI column, and add site and year columns to our data. We now have a clean dataframe with properly scaled NDVI and Julian days. Let’s plot our data. Create a complementary plot for the SJER data. Plot the data points in a different color. Comparison of plots is often easiest when both plots are side by side. Or, even better, if both sets of data are plotted in the same plot. We can do this by merging the two data sets together. The date frames must have the same number of columns and exact same column names to be merged. Now we can plot both datasets on the same plot. Plot the SJER and HARV data in one plot but use date, rather than Julian day, on the x-axis. As we look at these plots we see variation in greenness across the year. However, the pattern is interrupted by a few points where NDVI quickly drops towards 0 during a time period when we might expect the vegetation to have a higher greenness value. Is the vegetation truly senescent or gone or are these outlier values that should be removed from the data? We’ve seen in an earlier episode that data points with very low NDVI values can be associated with images that are filled with clouds. Thus, we can attribute the low NDVI values to high levels of cloud cover. Is the same thing happening at SJER? Without significant additional processing, we will not be able to retrieve a strong reflection from vegetation, from a remotely sensed image that is predominantly cloud covered. Thus, these points are likely bad data points. Let’s remove them. First, we will identify the good data points that should be retained. One way to do this is by identifying a threshold value. All values below that threshold will be removed from our analysis. We will use 0.1 as an example for this episode. We can then use the subset function to remove outlier datapoints (below our identified threshold). Thresholding, or removing outlier data, can be tricky business. In this case, we can be confident that some of our NDVI values are not valid due to cloud cover. However, a threshold value may not always be sufficient given that 0.1 could be a valid NDVI value in some areas. This is where decision-making should be fueled by practical scientific knowledge of the data and the desired outcomes! Now we can create another plot without the suspect data. Now our outlier data points are removed and the pattern of “green-up” and “brown-down” makes more sense. We can write our final NDVI dataframe out to a text format, to quickly share with a colleague or to reuse for analysis or visualization purposes. We will export in Comma Seperated Value (.csv) file format because it is usable in many different tools and across platforms (MAC, PC, etc). We will use write.csv() to write a specified dataframe to a .csv file. Unless you designate a different directory, the output file will be saved in your working directory. Before saving our file, let’s view the format to make sure it is what we want as an output format. It looks like we have a series of row.names that we do not need because we have this information stored in individual columns in our data frame. Let’s remove the row names. Create a NDVI .csv file for the NEON SJER field site that is comparable with the one we just created for the Harvard Forest. Be sure to inspect for questionable values before writing any data to a .csv file. Create a NDVI .csv file that includes data from both field sites.